Flower stems should be green and smooth, not slimy. There should be no broken stems or drooping buds. Keep cut flowers cool until you can get them into the water. Make a fresh cut an inch or two up the stem while stems are under water. Make sure the vase and cutting tools are clean. Use the packet of flower food that comes with your flowers. Keep cut flowers out of direct sunlight and drafts. Make a fresh cut each time you change the water. Alstroemeria is a very popular choice of cut flower, even though most people don't know it by its botanical name. Common names include lily of the Incas, parrot lily, and Peruvian lily. Alstroemeria flowers in late spring or early summer and comes in shades of white, pink, yellow, orange and red. The flowers are sensitive to fluoride in water. Let the water sit for a few hours, before using. 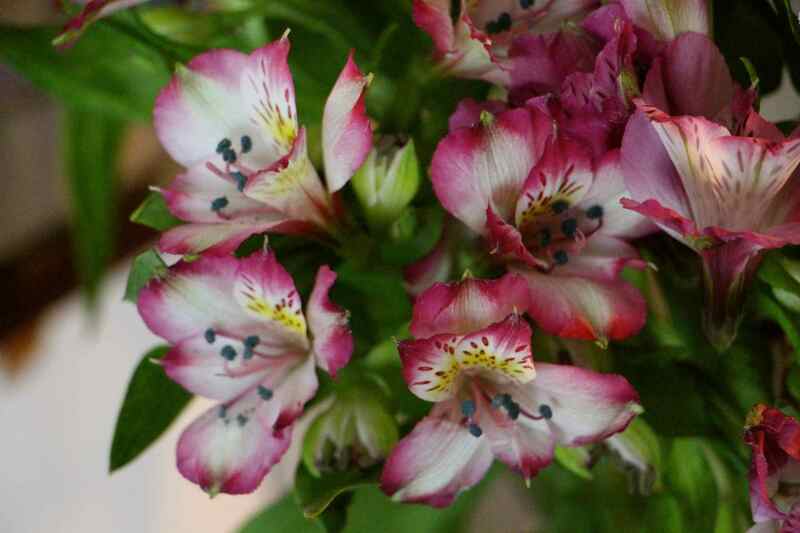 Alstroemeria is also affected by ethylene gas. Keep it away from produce, as many fruits and vegetables produce ethylene gas as they ripen. There's no mistaking the bird of paradise. The flowers look like colorful birds about to take flight. This is a tropical plant that needs lots of sunshine and warmth. It can be grown outdoors in frost-free areas or grown indoors as a houseplant. Even indoors, bird of paradise needs temperatures around 66.5 F to 70 F and at least 50 F at night. It makes an eye-catching cut flower, although it may need wiring to help support the heavy flowers. Carnations are one of the longest-lasting cut flowers. They are also easy to grow from seed and have a wonderful clove-like fragrance. Although they are most commonly thought of as flowering in white, pink, and red, they keep coming out with new varieties and what colors they can't breed, they dye to the shade they want. If you grow your own, you can have cut flowers well into fall. This relative of tomatillos and ground cherries is grown for the papery, bright orange husk that develops around its berries (which are poisonous). The bright orange seed pods can be used fresh in arrangements. If allowed to dry, they'll keep for months, maybe years. Chinese lantern can easily be grown from seed. It will self-seed, sometimes quite aggressively. Vase Life: Since you can display Chinese lantern fresh and dried, they will last indefinitely. You can't beat delphiniums for shades of blue and purple, although they also come in white and pink. They can be difficult to grow because they like cool, moist summers. Too much heat and humidity and they will fade away. If you can grow your own, cutting the flower stalks as soon as they bloom will encourage the plant to repeat flower. Like Alstroemeria, delphiniums are sensitive to ethylene gas. Don't keep them cool in the refrigerator. Gladiolus are among the most popular summer bulbs to grow. They can reach heights of 4 to 6 feet with their tall, spiky flower stalks. These are thirsty cut flowers, so keep an eye on the water level and refill when necessary. You can force unopened buds to open by using warm water in the vase and covering the flowers with a clear plastic bag. Gladiolus are very sensitive to fluoride. If your water is fluoridated, allow it to sit for several hours before putting your flowers in it. Sprays of heather are often used as airy filler in arrangements. They have long stems of small pink, purple or white flowers. Another option for the vase is the very similar looking heath (Erica sp.) These evergreens are very long-lasting when cut. Don't pack the stems too tightly in the vase, or they will mold. You can display any lily, but oriental lilies have the best fragrance. A bouquet of fresh oriental lilies can perfume an entire room. Choose sprays with a few slightly opened lower buds to prolong the bloom time in the vase. The stamens can drop pollen on anything that comes near them, causing an orange-yellow stain. Remove the stamens by hand, before displaying your lilies. Most Amaranthus species make long-lasting cut flowers. The long, distinctive, rope-like tassels of love lies bleeding hold their form and red color well. The plants are very easy to grow from seed, reaching 4 feet or more in height. Love lies bleeding can be direct sown or can be started indoors ​six to eight weeks before your last frost. Roses are the classic cut flower, with well over 100 million being sold each year. There are 20,000 varieties of roses, so they never get boring. Long stem roses are favored by the florist industry, but you can grow and cut any rose. Spray roses, with multiple blooms on each stem, make quick, charming bouquets. Crushing the end of the stem before you put it in the vase will help it take up more water. Homegrown sunflowers spend the early part of the summer growing tall and don't generally bloom until later in the season. You can find them at almost any time of year at flower shops because they have been imported. The traditional sunflower has bold, yellow flowers, but there are many new hybrids in shades of red and bronze. Sunflowers can be top heavy, so use a vase that can support them. Sun Exposure: Full sun–their flowers will face the direction of the sunlight.